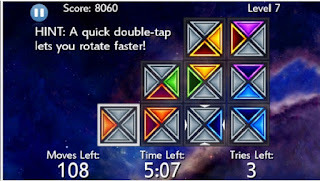 Andrey Biglari recently contacted me about his new puzzle game app: Rotago. I had to do the tutorial 3 times before I truly understood the directions. The first two times, I solved all of the tutorial levels, but still kept tapping wildly. Look at the first image. 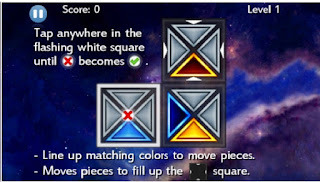 Your goal is to complete the square that is outlined by the little white triangles. Now look at the square that is outlined with the thick white line: that's the Active Square. Rotate that so the blue lines up with its neighbor and then transfer the blue triangle. That makes the neighbor the Active Square. Once you've done the tutorial, you advance to The Continuum which is 40 levels. You are given a time limit for each level and you may not use too many moves. Once you fail, you go back to level 1! 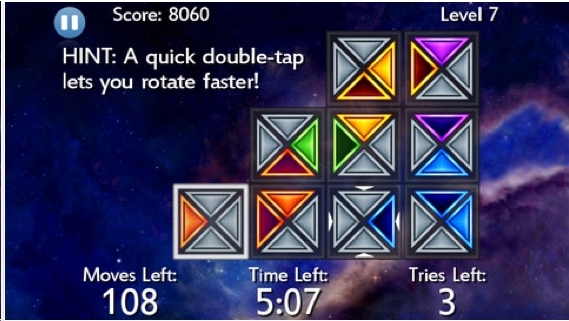 Rotago is actually a route-finding/shunting puzzle. On The Continuum, the levels start easy, but they get tricky and I started to panic. The highest level I got to was 14. Also, new puzzles are generated each time, so you can't memorize solutions. I'm normally averse to puzzles that give you a time limit. However, the time limit here makes the challenge: how many levels can you do? Rotago is one of the Best Puzzle Apps of 2013. Congratulations Andrey!